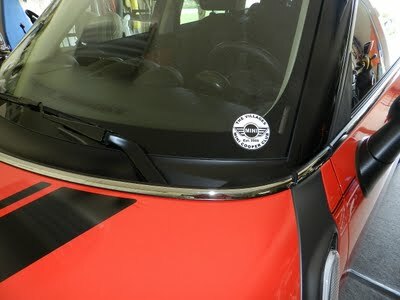 Each new member will receive one free decal when joining the club. (one per MINI, not one per person). Additional decals can be purchased for $1 each. The decal should be placed in the lower corner on the driver’s side. Thus doing, as you are driving down the street, other club members can identify you as a fellow club member. Suggestion…decide in advance where you want to position the decal. Clean and dry the area very carefully. Once you touch the decal to the window, it is stuck. Use a soft cloth to press it in place…careful to not scratch the decal with your fingernail or sharp object. In the picture below, the decal is positioned so that the vin number is not obscured. However, that is not really important because there are other places the vin can be found. It is possible to position the decal deep in the corner and hardly be seen from inside.